Create a Content and Blog Strategy that Keeps Readers Coming Back for More. Why Invest Time in a Content Strategy? For some, creating a content marketing strategy might seem like an obvious move. But according to the Content Marketing Institute, only 37% of B2B brands that regularly blog are using a documented content marketing strategy. This means that the majority of B2B sales blogs risk numerous issues that can throw a wrench in any content process. With no content calendar, for example, it's easy to fall into the trap of directionless content. Not using a keyword strategy? Then how will potential customers find you? Your business needs a content strategy because it provides direction and purpose for every single step in your content creation process. An effective blog strategy can keep you posting regularly, ensure the creation of helpful content, guide future efforts through performance analysis and much more. What Makes a Great Content Strategy? There is no single perfect content strategy - a strategy needs to be as unique as your business itself to yield success. Even so, there are essential components that the best blog strategies share. Buyer personas: Who are you writing for? Goals: Why are you blogging? Keywords: How do you plan to rank? Promotion: How will you spread the word? Analytics: How will you measure ROI? If this sounds like a lot of work, rest assured - it will be. But the results a strong strategy yields are worth the investment of time and effort. Mastering your content strategy will take time, but we're here to help you along the path to content marketing success. Explore these resources to learn more about building a digital marketing content strategy that delivers. The 5 Most Efficient Steps To Building Your Sales Blog Strategy: In this blog strategy guide, we offer five simple steps for building a content marketing strategy from the ground up. Content Writers' Complete 2018 Guide To Buyer Personas: The most successful business bloggers target highly specific audiences - and this is virtually impossible without in-depth buyer personas. The Ultimate Goal-Setting Guide For Blog Content Development: Does your content support your company's mission? Setting strategic, specific goals helps drive productivity and keeps your content marketing efforts focused on pushing your business forward. How Often Should You Blog? Find A Blog Schedule That Gets You Ranking: Blogging without a schedule is a recipe for disaster. Instead, make sure your blog strategy details precisely when each piece of content should be posted. Secret To Staying Power: Using Compounding Blogs To Enhance Content Strategy: Tackling trending, time-sensitive topics can benefit any content development strategy, but blog posts with long-term appeal will attract traffic for months (or years) to come. Our veteran writing team can help your business build a bank of valuable blog posts that check every box on your digital marketing content strategy. 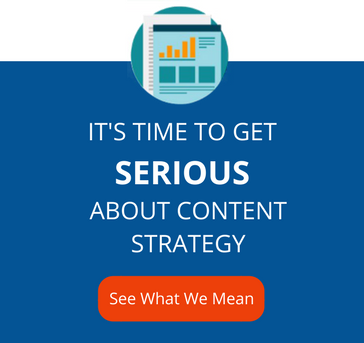 To learn more, check out how seriously we take content strategy.